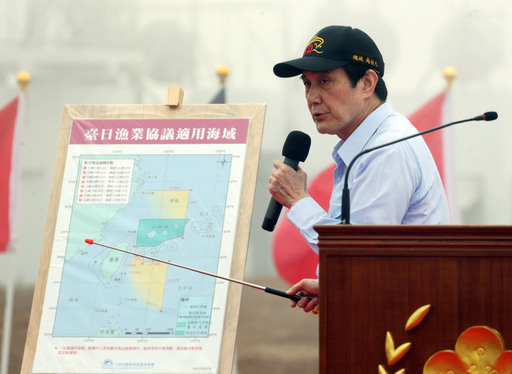 Taipei, April 9 (CNA) President Ma Ying-jeou (馬英九) unveiled a monument to his East China Sea Peace Initiative during a visit to an islet near the disputed Diaoyutai Islands Saturday, as part of his efforts to promote peace in the region. On arrival on Pengjia Islet on an S-70C helicopter, Ma hosted a ceremony to unveil the monument, which is inscribed with the words "Peace in the East China Sea and our national territory secure forever." His goal was to make clear the Republic of China's resolve to seek peaceful resolutions to disputes in the contested area, he said. It was Ma's second visit to Pengjia, which is located just over 30 nautical miles north of Keelung City in Taiwan and 76 nautical miles west of the Diaoyutais in the East China Sea. The 1.14 square km islet, which comes under the administrative jurisdiction of Keelung City, is Taiwan's northernmost territory and the closest to the uninhabited Diaoyutais. During his visit there on Saturday, Ma highlighted his East China Sea Peace Initiative, which was proposed in August 2012 amid escalating spats among neighboring countries over the Diaoyutai island chain, which is currently controlled by Japan, but is also claimed by Taiwan and China. In light of the disputes in the region, Ma said, he was again advocating shelving differences, pursuing peace and reciprocity and working together to explore resources there. The president noted that he laid out details of his East China Sea Peace Initiative while visiting Pengjia Islet for the first time in September 2012. At that time, he called for Taiwan, China and Japan to first conduct three parallel tracks of bilateral dialogue, and then move to a single track of trilateral negotiations to explore the possibility of jointly developing resources in the region, in order to achieve an "East China Sea Peace Agreement," he recalled. In his speech Saturday, Ma also noted that a historic agreement was signed between Taiwan and Japan on April 10, 2013 to address their long-standing fishing disputes in waters near the Diaoyutais. The agreement has largely reduced the number of fishing disputes, and allowed Taiwan to stick to its stance of "no comprise on sovereignty while expanding fishing rights," he added. Asked if he was worried that his initiatives would not be continued under the new government, Ma said he did not envision that the incoming president would go against achievements like the fishery agreement with Japan. On the South China Sea issue, Ma again spoke about his peace proposal that calls for all parties concerned to take action to reduce tensions, abide by international law, ensure freedom of navigation and overflight and seek a peaceful resolution to disputes. He said his trip to Taiping Island in January, during which he announced a roadmap for his South China Sea Peace Initiative, was aimed at demonstrating the ROC's resolve to address disputes in the region through peaceful means. Taiping, also known Itu Aba, is the largest island in the Spratlys in the South China Sea and is controlled by Taiwan. Peace policies are welcomed everywhere, Ma said. "That's because there's no winner in conflict, and there's no loser in peace," he said, highlighting his administration's efforts to promote peace in the Taiwan Strait and the East China and South China seas. Meanwhile, Ma revealed that Taiwan will hold a conference in Taipei on April 14 to discuss South China Sea issues and that after the conference, participating experts will be given the opportunity to visit Taiping. In addition to Ma and senior government officials, a group of activists who advocate defense of the disputed Diaoyutais also visited Pengjia on Saturday.